KV2 Audio’s philosophy has always been to embrace the principles of point source speaker system design to provide optimum sound quality and coverage for applications and audiences of all sizes. Up until now, their VHD2.0 Large Format Point Source System had been the company’s flagship, with the capability of covering crowds in excess of 10,000 people with just one or two enclosures per side. The challenge for KV2 in building even larger point source systems for audiences of 50,000 people plus, was to reproduce the low mid energy that certain line arrays provide though the summing of multiple drivers, while maintaining the key benefits of point source technology, being minimal destructive interference in the higher frequency range and accurate impulse response. George Krampera and his team of highly skilled engineers have overcome those challenges admirably with the development of KV2 Audio’s new VHD5.0 Constant Power Point Source Array. Utilising highly advanced point source speaker design, extremely efficient power management amplifier technology and totally unique hybrid signal processing, they have created what many believe, is the first major advancement in large concert sound reinforcement since the development of the Line Array. “On top of this we have focused on creating efficiencies never before achieved in amplifier technology to deliver not just high headroom transient peaks, but sustainable high voltage output over time resulting in far better control and definition of bass frequencies. The design of VHD5.0 Constant Power Point Source Array is such that the radiated power of each bandwidth, handled by the various components of the system, is consistent and balanced in relevance to the overall frequency response. 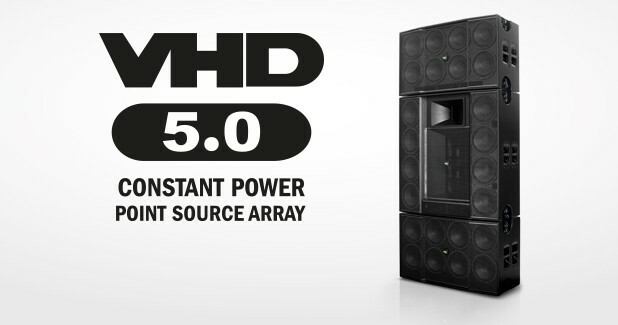 This ensures the sound remains the same in every seat in the house.” The VHD5.0 Constant Power Point Source Array will be released at Prolight and Sound in Frankfurt this April.